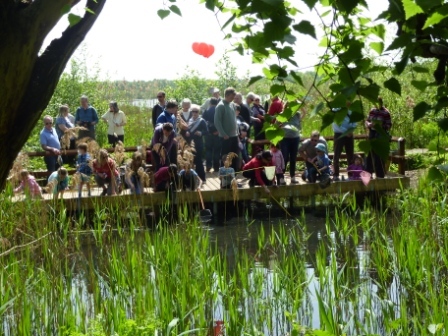 The sun beamed down on the Fleet Pond Wildlife Open Day as families enjoyed the multitude of activities and walks on offer. These ranged from guided insect walks, to demonstrations of chainsaw artwork – with the chance to part-take of delicious refreshments provided by Odiham Scouts. 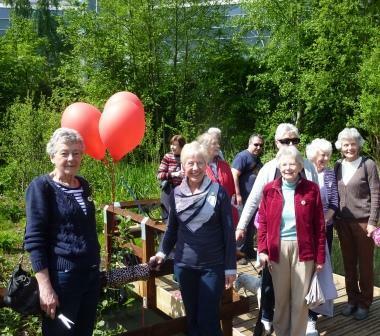 The new dipping platform, sponsored by the Fleet Townswomen’s Guild, and built by volunteers from the Fleet Pond Society was a roaring success. The platform was officially opened by ladies from the Guild, and for the rest of the day there was a constant stream of adults and children dipping the provided nets into the waters of The Flash. Congratulations to Fleet Pond Ranger, Louise Greenwood, and her colleagues at Hart Countryside Services for organising such a great day – including the weather! Fleet Pond Wildlife Day this Sunday! There are lots of exciting activities planned for the Fleet Pond Wildlife Day on Sunday 26th May. This free event is open from 10am till 2pm, so drop in anytime! In addition, there will be lots of stalls with interesting things to see and do, so why not pop in and try something new? Find us at Boathouse Corner, which will be signposted from the Main Fleet Pond Car Park and Fleet Train Station. Are You Interested In Trees? The government has already stepped up its activity to protect trees, and you can help too, by taking part in the OPAL tree health survey, designed in collaboration with Forest Research and FERA. The best time to do this survey is from May to late September. The Open Air Laboratories (OPAL) network is an exciting initiative that is open to anyone with an interest in nature. We aim to create and inspire a new generation of nature-lovers by getting people to explore, study, enjoy and protect their local environment. In 2007 OPAL received a grant of £11.75 million from the Big Lottery Fund. 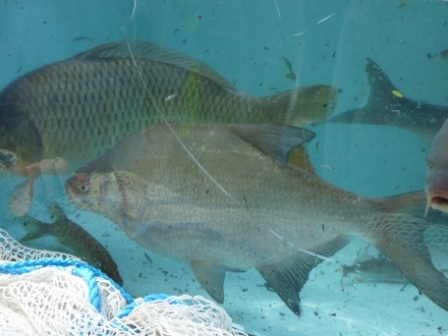 The benefits of OPAL have previously featured on this blog as University College London (UCL) have done fundamental work on illuminating the silt problem at the pond. 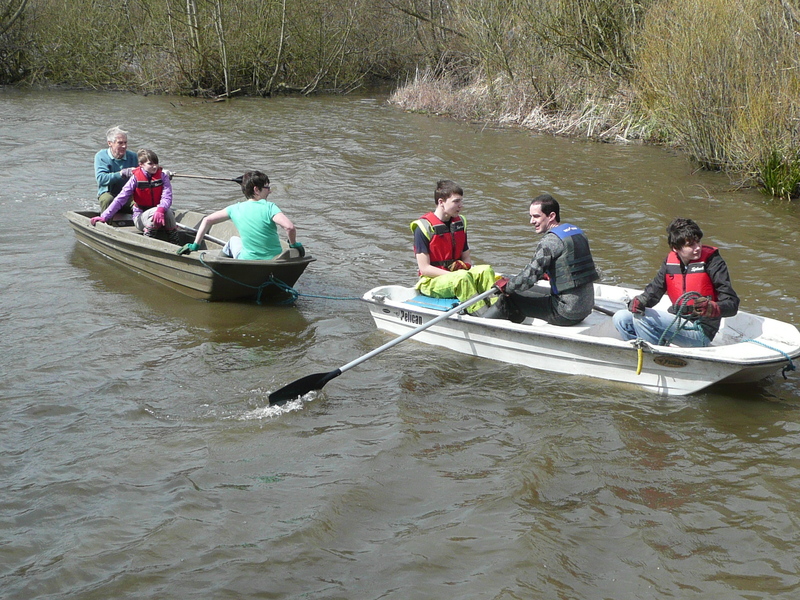 They also participated in the large Biodiversity Day event held in 2010 and organised by Jim Storey. See also here: Do You Know Your Trees? We’ve already advertised many of the fun activities for Fleet Pond Wildlife Day to be held on Sunday 26 May (10am – 2pm). If you would like to take part in any of the above walks, please book at the Hart Countryside gazebo at Boathouse Corner (see map on About page above). The gazebo will be sign posted from Fleet Station and also the main car park (off Cove Road). There will be only 20 places per walk, so please get in early! Like many other plants, the flowers of Wood sorrel have been late in making an appearance this year. But they are worth the wait, and the pretty white flowers and clover-shaped leaves are currently on display in large clumps alongside the footpath leading to Sandy Bay. 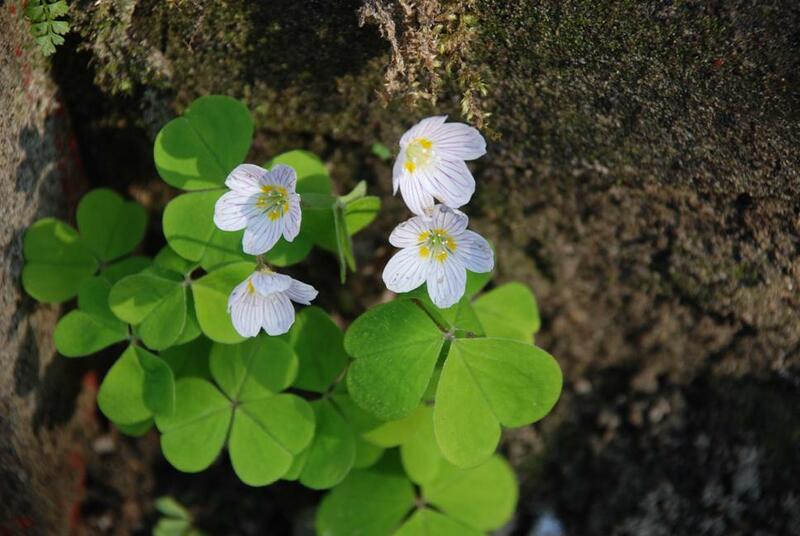 In 2009, I wrote a post called Wood Sorrel, the Easter flower and in that year the flowers bloomed in early April, which would be the usual time to see them blossom. Wood sorrel is a joy to photograph in indirect sunlight as the flowers open up to reveal five purple-veined white petals. The flowers close as light fades and the distinctive three-part leaves, which open out flat during the day, fold up on themselves at night. 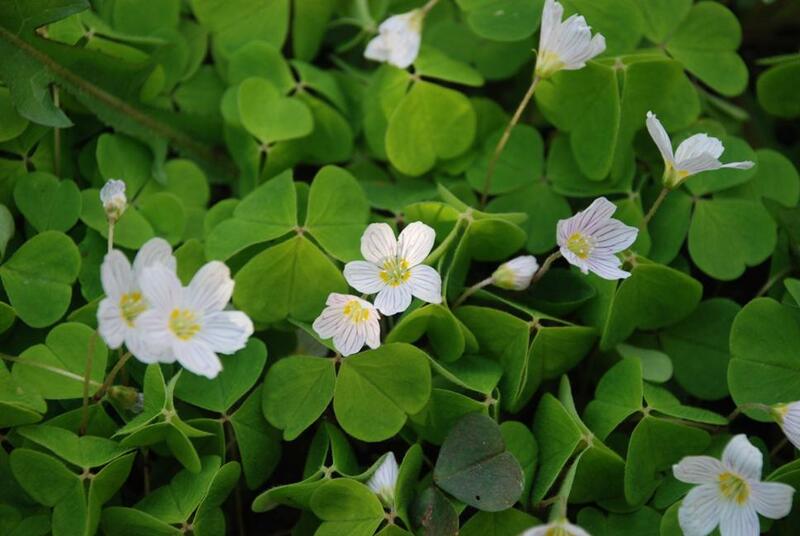 Wood sorrel is a shade-loving plant and can grow in locations that have only one percent daylight. 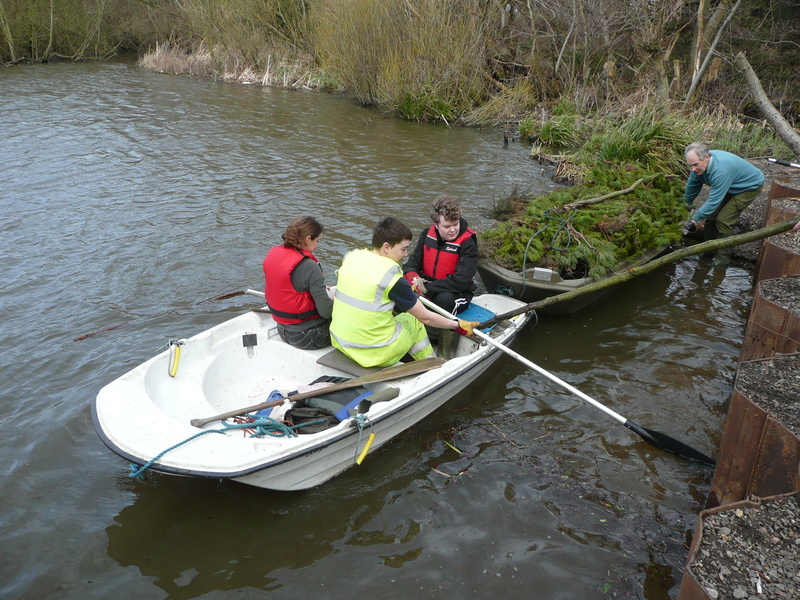 The task for the 12th May will be to continue to collect cut material from around the nature reserve to be moved to Boathouse Corner and from there out to the islands. As well as our regular volunteers, we will be joined by HSBC staff and also some scouts. 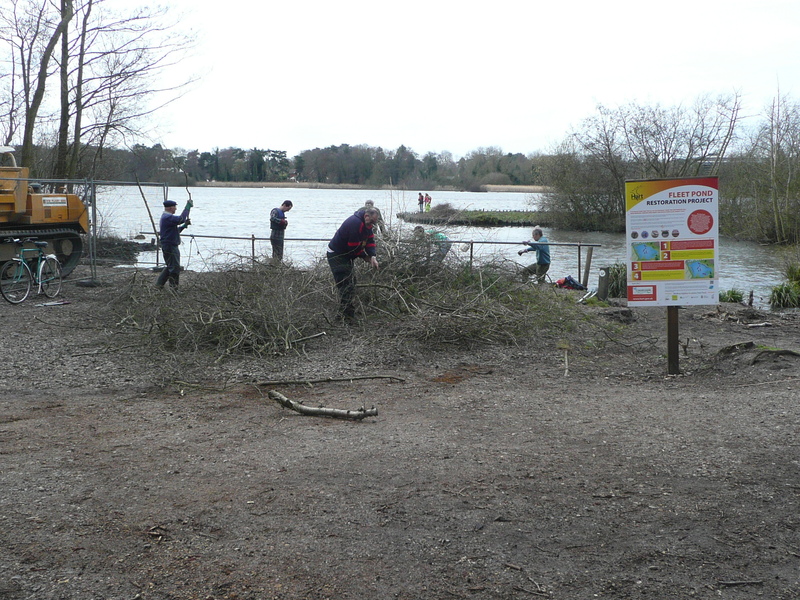 HSBC have helped out at the pond before – see here. Please meet at the Countryside Workshop to leave at 9.15 a.m. or follow the signposted directions from there if you come a little later. Full details of the Sunday volunteer events can be found here, including the schedule up to June 2013. All new volunteers are very welcome! Everyone returning after an interesting morning’s work! Warning – Possible Caterpillar Attack! “Beware! Warm weather has encouraged caterpillars of the Oak Processionary moth to emerge from their eggs. Each caterpillar has around 63,000 hairs, some of which can be blown in clouds by the wind, causing serious irritation to the eyes, lungs and skin. In some circumstances, they could even kill by triggering asthmatic attacks and severe allergic reactions. 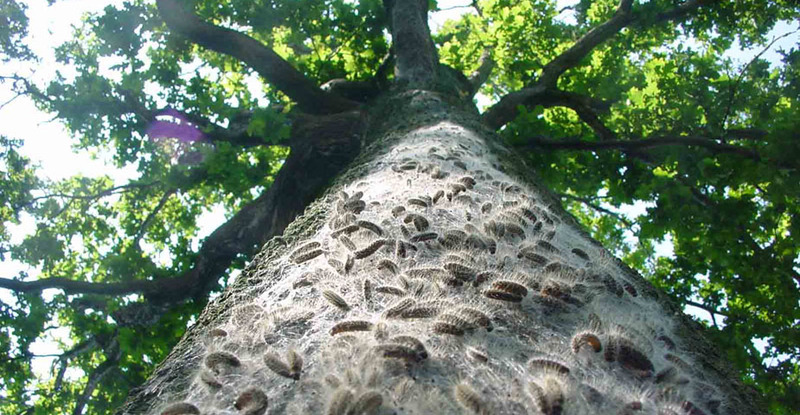 The caterpillars make white nests the size of a tennis ball in oak trees and, being voracious eaters, very quickly strip the trees of their leaves, before moving on to the next tree for a repeat performance. After pupating in late June or early July, the moths emerge about two weeks later. Caterpillars have already been spotted in Reading and in the grounds of Bethlem Royal Hospital, Beckenham in south-east London, so they are not far away. The Forestry Commission has issued an alert for South-east England, particularly areas including Bromley, Croydon and parts of Berkshire, asking people to be vigilant. Kew Gardens has even sprayed its oak trees to try and prevent an attack. Dr. Yvonne Doyle, the London Regional Director of Public Health, has said that anyone who experiences an itchy or painful skin rash, sore throat or irritated eyes after being near oak trees should consult their GP or ring NHS111. Don’t touch the caterpillars and keep well away from them. Further information on this topic (from the Forestry Commission) here. You are currently browsing the Fleet Pond Blog blog archives for May, 2013.